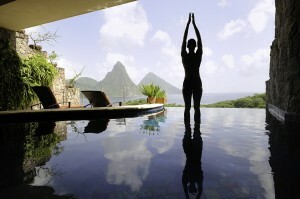 Jade Mountain in St Lucia offers spectacular, soothing views. Chocolate festivals, which equal heaven for lovers of chocolate, are ubiquitous around the world. But to really immerse yourself in the world of chocolate, head to where it grows. During St. Lucia resort Jade Mountain’s chocolate festival in December, guests can enjoy the food of gods in the shade of cacao trees. From December 9-12, Jade Mountain relishes in chocolate. A “Chocolat-tini” party kicks off the event, with complimentary chocolate martinis on offer. Consulting chef Allen Susser has conjured up local, seasonal chocolate inspired savory finger foods, and after dinner, it’s time for more chocolate in the form of exotic chocolate desserts. The following day, guests get to know the cacao tree with a walking tour through the cacao plantation and organic gardens. Chef Allen leads a workshop on the transformation of cacao into chocolate. Dinner continues with even more chocolate: a five-course dinner with chocolate in each course, promising creative pairings, flavors and textures. December 11 begins with a chocolate-themed breakfast in bed at a time of your choosing. And as if all that wasn’t enough chocolate, Jade Mountain has one more indulgence: a cocoa spa treatment, packed with anti-oxidants. Luxury resort Jade Mountain is a delight to the senses even without all that chocolate: rising above a 600 acre beachfront estate, the resort features organic architecture which celebrates the natural beauty of St Lucia. A delectable, albeit pricey, treat. For more information about the festival, visit Jade Mountain’s website. Read more stories about the Caribbean at GoNOMAD.